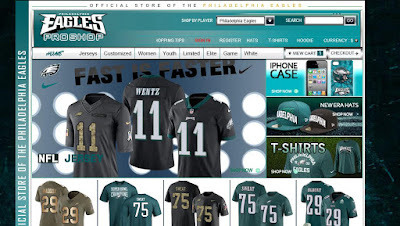 “Official Store of the Philadelphia Eagles”- this is the tag line used by Theeaglesshoponline.com, an online store keen on convincing us that its imitation jerseys are of very high quality and can be bought at the most affordable prices. But no matter how good it sounds, we, wise shoppers, know how rare this is on the Internet so let’s see how accurate its statement really is. Theeaglesshoponline.com is a nice looking website, very elegant and user friendly. It is full of buttons, menus, banners, and pictures, without being too crowded. Somehow, it is carefully organized and designed as to truly look like a professional store for high quality replica jerseys. The collection is pretty wide and diverse. The store sells ones of the most popular Eagles jerseys in Philadelphia. Each category includes a very impressive number of models, and to ease our access to the products that interest us. I was disappointed to notice that there is no advanced search option. The prices of the Eagles jerseys start at $13.99 and go up to $27.99. The price depends on the type of the product. The customized Eagles jerseys cost about $39.99 while the Eagles Hoodies cost about $39.99. These prices are pretty affordable and justify the materials and qaulity of the replica Eagles items. Furthermore, these are the average prices available on the online market of imitation jerseys. On the FAQ’s page it says that the company accepts Visa, Mastercard, Paypal, Western Union and Money Gram payments, still after adding a product to the shopping cart, you are informed that paypal payment is no longer accepted and that the available payments method are credit card and Western Union. Additionally, you also receive a free product as gift for using Western Union as payment option. I find this as a doubtful business practice. I am very reluctant about buying a replica product from a website that accepts only Western Union payments. From my point of view, the only safe payment option when ordering online is by credit card or paypal. This way your bank will always protect the transaction. The Eagles Shop Online ship’s packages all around the world and for most countries the shipping fee is $19.99 USD. The orders are shipped with EMS and DHL and all of them are assigned with a tracking number. Once the package is shipped, you will be emailed the tracking number so you can track the order online. Theeaglesshoponline.com offers a 10 days return policy. This policy states that all jerseys with a quality defect can be returned to the company for a refund or exchange. Of course, the return shipping fee will not be compensated. Also, before returning a replica Eagles jersey that is defective, customer service must be contacted and supplied with photos of the defects. Only after these defects are confirmed, the customer is authorized to return the product. 10 days is a very short time frame for guaranteeing the quality of a replica. What happens if the knockoff breaks in a month or two? The pictures seem to be copied from official Eagles store. The photos are of very good quality. Either way, I wouldn’t order something from this place unless they send me a picture of their actual merchandise to prove that they are legit. 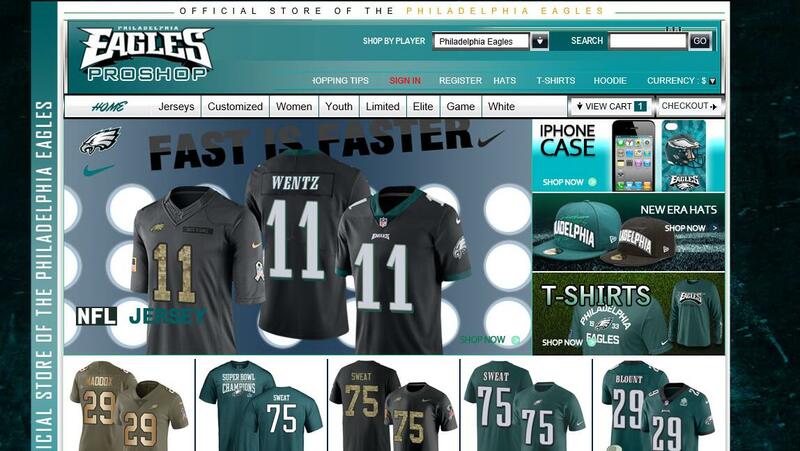 The Eagles Shop Online does not have a professional customer service. It cannot be contacted by phone, email or live chat. If you need to ask a question you can only send a message through the contact form listed on the website. I do not think that this qualifies as a responsive customer service and does not give me any reason to trust the company. My advice for you is to first try to contact customer service, and order from this store only after you have received an answer from them. Theeaglesshoponline.com is an online replica Philadelphia Eagles company that has invested a lot in creating a beautiful website, a wide collection of fake jerseys and suggestive product photos. The problem is that there are many things that recommend it as an unprofessional store and these are: lying about accepting PayPal payment, unresponsive customer service.